Backdating again! I forgot I had these from the last week of April. It was a leftover Wednesday fest! We actually had taken the kiddos to Applebees on Tuesday afternoon and I realized that their leftovers were perfect for bentos the next day. Of course, they had two different meals, so they had two semi-different bentos. 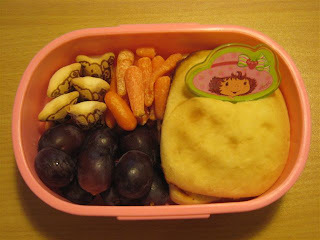 Faith had a mini cheeseburger (I added the SS pick for her), carrots, grapes and koala cookies, plus a container of yogurt. 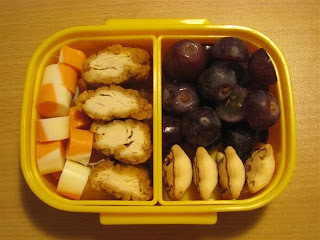 Ben had some leftover chicken strips, cheese cubes, grapes and koala cookies, plus a container of yogurt. And I had the pleasure of not having to throw out the leftovers!